The ticket is marked resolved, and the service management software sends off a customer satisfaction survey email to the customer or end user. The customer answers a few questions, mostly about the treatment she or he received during the service transaction, and sends the survey form on its way. Unless it carries extremely good or extremely bad ratings, the survey simply becomes part of the monthly results and is never looked at again. If a survey conveys a very low satisfaction score, a manager will review it to see if someone on the staff needs remedial coaching and also likely contact the customer to see if the relationship can be repaired. The customer’s answers having anything to do with the personal interaction, that is, questions like “Was the analyst courteous?” might be kept aside for future performance reviews. On the flip side, praise for the analyst is also kept for consideration in future reviews. It is worth remembering that the customer or user did not contact the service desk in order to be connected—through one channel or another—to a courteous, professional, efficient analyst. The customer contacted the service desk to ask a question or to solve a problem. Courtesy, efficiency, and professionalism do not directly solve problems, nor do they cause them. So why are we asking the same questions about the personal interaction again and again? In good but static organizational cultures, one reason is that “it’s always been done this way.” No one has had—or taken—the time to find better questions to ask. In not-so-great organizational cultures, these questions make it easier to assign blame. Assigning blame should not be the goal of any survey, and the blame game should be avoided. Although the exact numbers are still debated, we do know that many of the interruptions users experience are caused by changes in the IT infrastructure. Software updates, router configurations, server changes, and unexpected updates pushed from SaaS providers seem to conspire to cause end users to have to seek support, whether from peers, online search, or—as is often their last resort—the service desk. Chances are that the helpful service desk analyst at the other end of the phone call, chat, or email has nothing to do with the cause of the interruption and does not have the power (i.e., the access and authority) to fix it, although she or he may be able to walk the user through a temporary fix (workaround). It is not the service desk’s job to determine root cause (that’s for problem management). It is the service desk’s job to get the customer back to their work as rapidly as possible. If the analysts are getting that job done, stop blaming them—or having customers blame them—for things they cannot control. 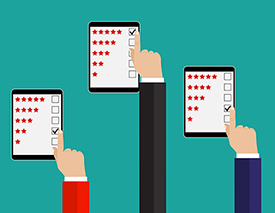 Although it may be that the service desk is the only unit conducting customer satisfaction surveys, that doesn’t mean that valuable information about the overall service provided to the customer can’t be collected and disseminated to the rest of those involved. Remember, everyone is supposed to be working together to keep people working and help the business succeed. Transactional surveys are just that: based on transactions, not an overall relationship. What is true in that survey today may not be true tomorrow or the day after. Surveys of any kind will give you only part of the story. Keep an open dialog with your customers, especially with your least satisfied and your most satisfied. They can help you understand what their expectations are and how you can better meet them.